In Big brother's Language Arts curriculum, he recently learned about similes in a Poetry Unit. Along with reading through different poems, the book suggested making a Simile Mobile... and that is just what we did! 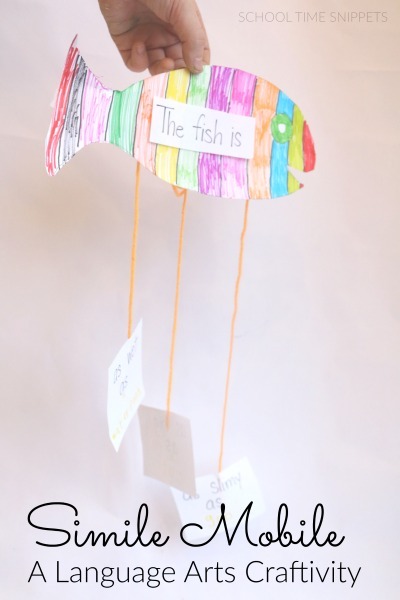 This simple simile craft can be used with a great many objects, but is a fun activity that will get your child thinking and writing creatively! Next, write out your sentences comparing your object to something else on small pieces of paper. Once the writing portion is complete, have child draw out the object on a piece of paper. Have the child color the picture and cut it out. Next, cut three pieces of yarn-- one for each sentence. Tape one end of the yarn to the back of your object. Attach the completed similes to the other end of the yarn with tape. Big brother adored this fun simile craftivity! I think you should try it out, too!